Tag Archive | "Emerald Green Cat"
The Emerald Green “Cory” Cat (Brochis splendens) is also known by tropical fish keeping enthusiasts as the Emerald Brochis, Emerald Catfish, Green Cory, or Emerald Cory and comes from the upper reaches of the Amazon, Rio Ucayali, Rio Ambiyacu, Rio Tocantins, within the countries of Brazil, Columbia, Peru and Ecuador. These catfish are not Corydoras, even though they do bear a striking resemblance to C. aeneus. The Corydoradinae sub-family contains the Aspidoras, Brochis, and Corydoras genra which are all closely related and nearly identical in their behaviour and housing requirements. 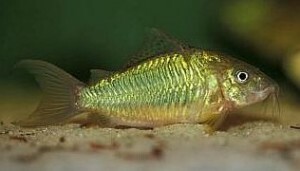 Brochis splendens is the most common in the aquarium trade. Emerald Green Cats live in sluggish water and slow moving streams that have a great deal of vegetation. They prefer a neutral to slightly acidic pH low light environment, and should be kept in groups of at least 6 or more specimens. Brochis splendens have a striking iridescent emerald green body with a pinkish underbelly. The dorsal, pectoral and adipose fins of these fish are each preceded by a spine which is actually a hardened and modified ray. As a defense mechanism, the pectoral fin spine can be locked into position and is capable of causing a nasty “sting” when improperly handled. Emerald Green Cats are a popular and efficient scavenger that will add interest and an ornamental presence to any peaceful community tank. To replicate their natural habitat, the Emerald Green Cat should be housed in at least a 30 gallon tank with a sand substrate, densely planted and aquascaped with driftwood , roots, rocks and other objects for them to hide in. They require soft to moderately hard water (to 30 dGH), an acidic to neutral pH, water temperatures of 71-82° F and strong filtration to remain healthy. 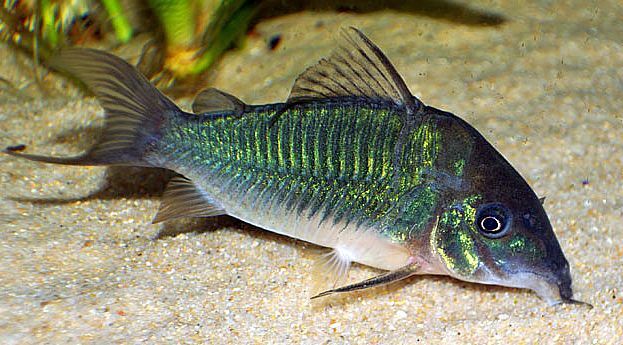 Like Corydoras, the Emerald Green “Cory” Cat will collect eggs in a basket made with the female’s pelvic fins and deposit them individually on rocks, plant stalks, driftwood or the aquarium glass. Females are prolific egg layers and can produce over 1,000 eggs. or live tubifex will get them into breeding condition. When available for purchase, Emerald Green Cats can be anywhere from 1″ to over 2″ in size.